John Michael McDonagh’s Calvary is not a great film: its plot requires more than a little credulity, and its stabs at humor miss more often than not. It is, however, an important film — one, I daresay, that will remain with its audience long after they view it. 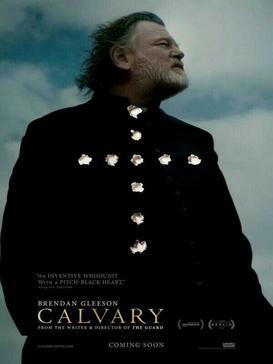 With a nod to Hitchcock’s I Confess (1953), Calvary begins in a confessional in a small church in the West of Ireland (probably County Sligo, given the lurking presence of Benbulbin). An unidentified parishioner confesses to Father James Lavelle (Gleeson) that, as a young boy, he was horrifically abused by a Catholic priest and that he wants to take the life of Fr. James as recompense. He reasons that the depth of his hurt and vitriol will be clearer if he murders a good priest rather than a bad one. For his act is as symbolic as it is personal: he does not want to simply kill Fr. James but the very idea of a priesthood — that is to say, of a group of persons who mediate the will of a loving God. But this task, Calvary suggests, is precisely what’s at issue. In re-presenting the person of Jesus, Fr. James is offensive to others, whether in his presumed arrogance (in claiming to mediate on behalf of God) or in his palpable lowliness (in doing so in such humble fashion, without wealth or honor). Indeed, one cannot see the good he is seeking — to comfort and to encourage the afflicted — without passing through the crucible of offense. Within the context of the film, one such person is Fiona (Kelly Reilly), Fr. James’ daughter, who has struggled to accept his priestly calling after the death of his wife and her mother. In particular, Fiona resents the fact that, rather than focus on the healing needed in his own life and family, her father has chosen to minister to a parish of ingrates and misanthropes. Towards the end of the film, however, the pair arrive at an understanding: both of them, albeit in different ways, have spent far too much time worrying about what’s wrong than doing what’s right. As Fr. James puts it, “[F]orgiveness has been highly underrated,” not just in his relationship with Fiona, but in the Church’s ministry and its relation to the world — even a world as bellicose as this one. It is this wisdom that gives Fr. James the strength to complete his passion and to meet his would-be killer — a conclusion that is no less gripping despite its inevitability. But is Fr. James’ witness in vain? McDonagh does not answer this question directly and perhaps for good reason. In the wake of the abuse scandal in Ireland, America, and elsewhere, there are no straightforward answers. What Calvary does suggest, however, is that the Church can only regain its footing through a commitment to goodness — a commitment that refuses to waiver in the face of scorn and suffering. It’s a cutting message, but not a hopeless one. Like its namesake, Calvary is not so much about death (death of the good, death of the Church, death of God) as about what comes after death. Life. I love reading your reviews. Thanks for helping with my “to see” list! !